VI's first Bio-Diesel blending pump at Bings Creek in Duncan. Photo by M Hassaan Rahim. 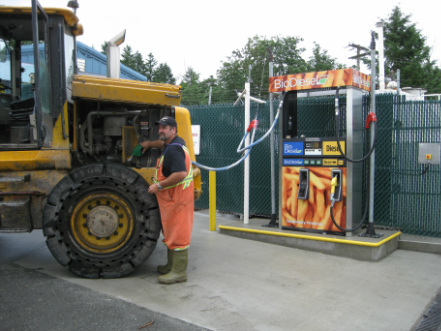 ​Joining the Cowichan Bio-Diesel Co-op is a vote for alternative energy solutions. By supporting local renewable fuels like biodiesel, community members can change our energy landscape and reduce our carbon footprint. At the Cowichan Bio-Diesel Co-op, we believe that individuals can change the world, but only if we work together. Join the CB-DC in our quest to localize and diversify our community energy providers. With around 200 individual and corporate members from Victoria to Cortez Island, it's members like you that make all this possible. With the opening of our new community-scale Cowichan Biofuel Facility, 'Green & Go' - Vancouver Island's first Bio-Diesel blending pump, the recent International Collective Biofuels Conference, and future projects in the work, there has never been a better time to join forces with your local alternative energy provider. Start your journey to a more sustainable future today! The annual fee for joining the list of change-makers and Coop membership is $60. If you are joining for the first time, there's a one-time $5 charge for buying a share of the co-op. The membership fees gets you access to all the biodiesel related literature and newsletters published by the coop plus voting rights at the AGMs. If you are an organization, with a fleet, please email us at info@smellbetter.org and we will be better able to help you. Help the co-op and receive free bio-diesel! All current CB-DC members are encouraged to participate in our referral program to receive discounts on membership. By referring family members, friends, community members, businesses, employees to becoming a member of the Cowichan Bio-Diesel Co-op, you and your referral will receive 50% off both your next membership. All you have to do is make sure the person you refer mentions your name when they sign-up, and once their membership is paid you and your friend will receive the 50% membership discount. Just remind them to sign-up by calling our office at (250) 748-2694. The fuel provided by the CBDC is mostly ASTM Certified. However, it is up to the owner's discretion to appropriately blend the fuel depending on their individual vehicle and the weather. CBDC will not be held responsible for rich biodiesel blends that cause vehicle problems including but not limited to: rubber seal problems, fuel line problems, gasket problems, warranty violations, injector problems, fuel filter clogs. It is up to each member to ensure their vehicle is mechanically sound and able to run biodiesel. The pump and cardlock is regularly tested for accuracy, however in cold weather the biodiesel can gel and stop flowing. Members should be aware of cold temperature conditions and should follow signage at the pump indicating conditions.